Mr Skripal and Yulia were poisoned in Salisbury, in the UK, in March. “We know who they are, we have found them,” Mr Putin said in the far eastern city of Vladivostok. “I hope they will turn up themselves and tell everything. This would be best for everyone. There is nothing special there, nothing criminal, I assure you. We’ll see in the near future,” he added. BBC Moscow correspondent Sarah Rainsford called Mr Putin’s words a “tantalising hint” that the two men will speak “very soon”. “But the question of course is who will we see because don’t forget that, in the UK, the suspicion is that the two names that were given are in fact aliases,” our correspondent added. UK police said the two men arrived at Gatwick Airport from Moscow on 2 March and stayed at the City Stay Hotel in Bow Road, east London. The pair flew back to Moscow from Heathrow later that night. 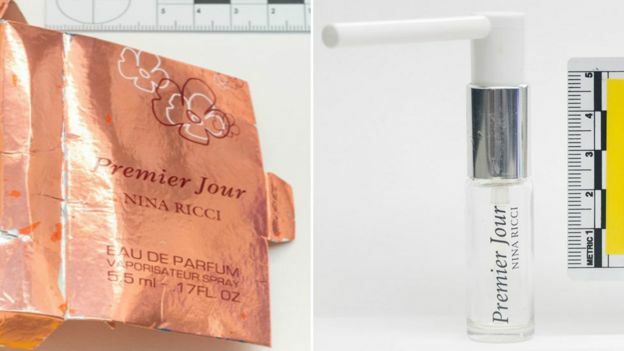 Image captionThe counterfeit perfume bottle recovered from Mr Rowley’s home and the box police say it came in. He tried to put bottle and applicator together and got some of the contents on himself. His partner, Ms Sturgess, applied some of the contents to her wrists and became unwell. The attack in Salisbury prompted an international row, with more than 20 countries expelling Russian envoys in solidarity with the UK, including the US, while Moscow expelled diplomats in response. Last month the US confirmed it was implementing fresh sanctions against Russia over the incident. The UK’s Prime Minister, Theresa May, has also said Britain will push for the EU to agree new sanctions. Since the UK named the two suspects, US, France, Germany and Canada have agreed that the Russian government “almost certainly” approved the poisoning of the Skripals and have urged Russia to provide full disclosure of its Novichok programme. In response, Russia accused the British authorities of “Russiaphobia”, misleading the international community and UK citizens and of “disgusting anti-Russian hysteria”.